Question: I’m a lifelong trout fisherman, but after the dry, hot summer we had, I’m thinking more about taking up saltwater fishing for stripers and bluefish and stuff. I know that fall is when the famed “blitz” occurs. However, I don’t really know where to start. On a river, I can identify likely trout lies, but the ocean seems kind of featureless. Where should I start? Answer: I used to feel the same way about saltwater fly fishing. When I lived in New Jersey, I was only about a half hour from Sandy Hook—a well known striper hot spot—but instead I would drive an hour to fish the stocked streams in the western part of the Garden State. I even owned a 9-weight rod, but I just didn’t have any confidence that I knew enough to catch a striper. Finally, my older brother, Brian, took me out on a marsh on Cape Cod, where we fished an incoming tide. One of the first things I noticed was that the tide moved just like a river as it came through the narrow gut; it wasn’t, in fact, all that different from trout fishing. I swung my Clouser through the current the way I’d swung a streamer thousands of times for trout. I even caught a schoolie that evening, which was further proof that I’d been overestimating how difficult saltwater fishing could be. So, my advice is twofold: first, get someone to take you fishing. There’s no substitute for having a guru who knows where to go, what flies to use, and can make sure you don’t drown. Second, pick up a copy of Lou Tabory’s Inshore Fly Fishing. It came out almost 20 years ago, but trust me: nothing has changed. 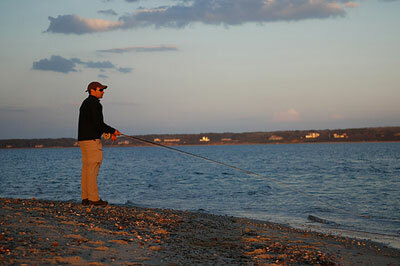 It explains pretty much everything you need to know about fishing from shore in the Northeast. Ultimately, what you’ll find is that the best places to find stripers make sense to a river fisherman. In general, they like moving water; places where bait is concentrated by wind, wave action; or current; and structure. This means jetties, river and creek mouths, places where tidal action is funneled by geography or man-made features, rocky coastlines, etc. The best fishing occurs under the cover of darkness, when the fish cruise the shoreline in search of bait. The ocean is vast, but a fisherman can break it down into discrete features that make the prospect of catching a fish less intimidating. So string up that 9-weight with an intermediate line, pick up a few Clousers and Deceivers, and give it a shot. The first time a hooked striper starts peeling line off your reel, you’ll wonder why you waited so long to try casting in the salt.